Ethics Webinar to cover the required 1 hour CPD Ethics training. Content feeds all other digital marketing activity. This webinar gives insight into what Content Marketing is, why it's important and how to create a Content Marketing Strategy. Please note: You can submit any questions you may have and we will collect these and respond following the webinar. Note: Incorrect timezone may display below if you are not logged into BrightTALK. This Social Media Marketing webinar explores the benefits of including social media in your digital marketing strategy. Join us for 30mins where we will walk you through our new Max Funding Tool and also showcase many of the features of the new ZurichBroker.ie that you might not be aware of. Whether you're starting from scratch or improving on what you already have, this webinar highlights the key components for a strong web presence. Join Zurich for our regular Protection update - covering our latest claims experience, some innovative product ideas, and hear the latest thinking from our reinsurer. This webinar explores the importance of having an online presence for your business and practicing digital marketing to remain competitive. David Warren, CIO, will be joined by Philip Duggan and Anthony Conroy to discuss what we saw throughout 2018 across investment markets, and what we may see as we look ahead to 2019. James Caron & Ronan O‘Neill Note: Incorrect timezone may display below if you are not logged into brighttalk. Justin Kelly & Niall Concannon Note: Incorrect timezone may display below if you are not logged into brighttalk. This is the latest in our Summer Series of Technical Webinars - in this session we will cover Executive Pensions and in particular the maximum funding opportunities. Kicking off the Zurich Summer Series, this webinar will cover everything you need to ensure you provide your clients with the best advice. David Warren, Chief Investment Officer, along with some of his team will discuss the latest movements in risk assets, and give our outlook on equities, bonds, and the global economy. Listen in to hear about Zurich's new and improved Protection product with improvements across price, contact and online ease of use. David Warren, CIO, will be joined by Philip Duggan and Anthony Conroy to discuss what we saw throughout 2017 across investment markets, and what we may see as we look ahead to 2018. 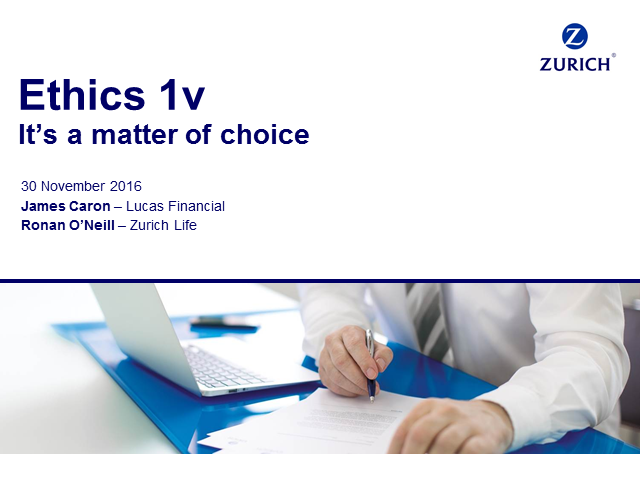 Join Zurich and James Caron for your annual 1 hour Ethics CPD requirement. This is one of Ireland's most viewed webinars and we are delighted to run it for the 4th year in a row! Please join David Warren, CIO, along with some of his team and the share their thoughts and insights from the first three months of the year. The team will also provide us with their outlook for investment markets going forward. Join the team at Zurich Investments to discuss the implications and market reaction as Donald Trump is elected the 45th President of the United States. Subscribe to the Zurich Life Ireland channel to view live and on-demand webcasts on Life, Pension and Investment topics.